Playsuits were the 1920s version of overalls for small children. Overall out start being worn by both sexes in the 1930s, but before that the play suit was the thing to do. Playsuits are bloomers worn under a short dress like tunic. They usually have a high waist and a aline shape to the dress and then the bloomers just peep out the bottom. It’s really a very girly look for play clothing, but still is pretty practical, all things considered. Normally a style for younger children, I had some conflict about drawing a play suit for the Poppets. In my head, the Poppets are between 7 and 9 years old. The playsuit is really a style mostly for younger children, but I found a few that were cited as fitting children up to 8 years old. I decided that they were on the edge of the age range, but I would go for it anyway. I didn’t record where I got this design from. This is shameful behavior for a librarian and I swear the next batch of the Poppet’s 1920s Collection is all properly cited. However, I am pretty sure this play suit is from the book 1920s Fashions from B. Altman and Company. I can’t say for positive, but I am pretty sure. 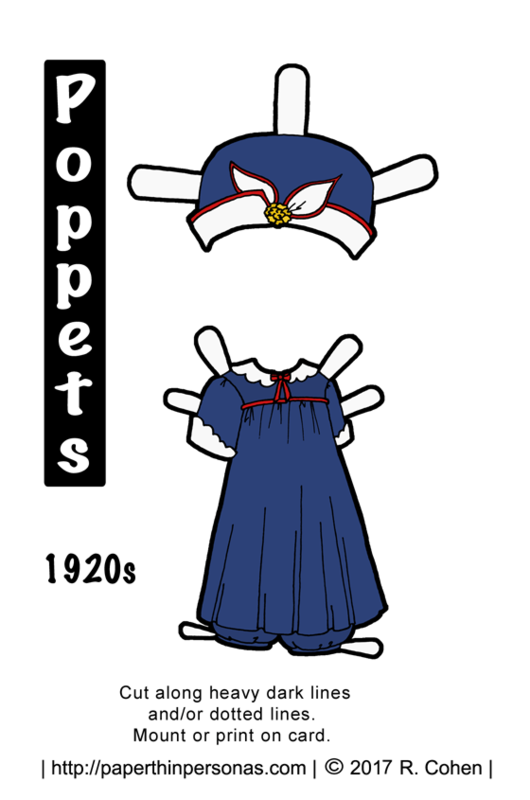 If you feel like you need a Poppet to wear this outfit with the right hair or you are just feeling like you’d like some more 1920s styles, you can check out the whole collection under the “1920s Children’s Wardrobe Collection” tag. So, what do you like today’s 1920s paper doll playsuit? Let me know in a comment. Always love to hear from y’all. If you have a moment, think about becoming a Patron or liking it on facebook. It really does help. I love playsuits, and had so much fun dressing my daughter in them until she had an opinion about clothes at age 2.